Android 5.0 has been publicly available for a little over a month now, and although Lollipop hasn’t quite made a significant dent in terms of market penetration, the OS has certainly gained steam among the power user and developer communities. We’ve seen a rather large spattering of ports to various devices, old and new alike, and this is only going to continue as time goes on. While much of Lollipop’s underlying architecture is the same as previous versions, much of it has changed. As we’ve all known for quite some time, Android 5.0 finally did away with Dalvik and replaced it with ART. While this was a fantastic move in terms of performance and battery life savings, it also has some side effects for certain categories of users. In addition to being (currently) incompatible with Xposed Framework, Lollipop’s switch to ART also means that decrypting system apps has to be done differently. Luckily, XDA Senior Member Tech N You created a quick guide that walks you through the process of using Oat2dex converter to decrypt Lollipop apps and Jars. As we know in Android 5.0 Lollipop framework, app, priv-app folder we have * .apk files and * .jar file, and subsequently when you look at the sub-folder called * .odex files they have a specific folder for art runtime in order to compress into two modes. * odex.art.xz -> The art mode to native file. * .odex.xz -> 7zip * .odex appears when you unzip the file. * .odex.xz unpack the file compression, uses the * .odex file. 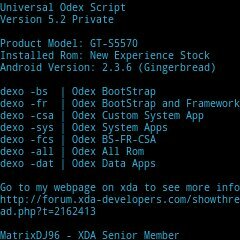 So in order to deodex files we need this deodex tool and your apk along with *.odex.xz. If you’ve been looking for a simple way to Simply make your way over to the Lollipop Deodex guide for Windows thread to get started.